Fus - I'd like to register a complaint about JSG with you moderators .... He's just made a really objectionable post on this thread!! Best we ban him until he's been through some serious re-education! Rest assured that we have the individual in question under very strict surveillance and are considering what further steps to take. New manufacturing process yields high volume, low cost carbon fiber for transportation, renewable energy, and infrastructure. What about the bikes? I don't see anything specifically about bikes. Cycling is a niche in the context of the business world. I'd say bikes are covered by 'transportation markets'. Does this count as a new technological feature? 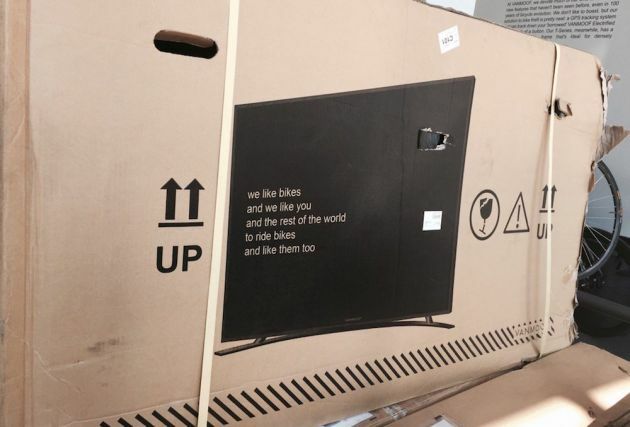 A Dutch bike manufacturer has started printing flatscreen TVs on their bike boxes - and shipping damage is way down. When will cyclists stop littering wherever they go? A gel wrapper doesn't take up much space. To give the cyclists a helping hand, when will cycling kit manufacturers start (or rather, continue) incorporating 'waste pockets' in their jerseys? Whatever happened to this brilliant idea?